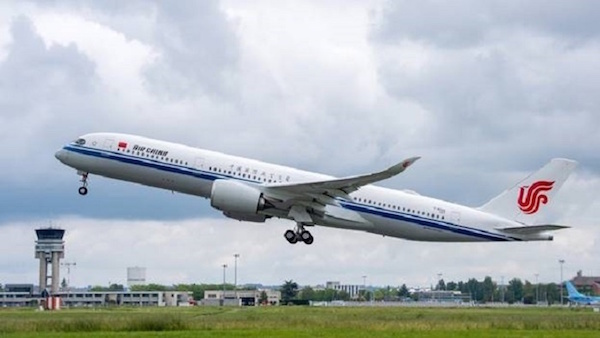 Air China has taken delivery of its first A350-900 in Toulouse. The national flag carrier is the first Chinese mainland customer to order and take ownership of the world’s newest and most efficient twin-engine widebody aircraft. Powered by Rolls-Royce Trent XWB engines, Air China’s A350-900 aircraft features a comfortable three-class cabin layout of 312 seats: 32 business, 24 premium economy and 256 economy. The airline will initially operate the new aircraft on its domestic routes, followed by flights to international destinations. As of July 2018, Air China operates an Airbus fleet of 201 aircraft, including 142 A320 Family aircraft and 59 A330 Family aircraft. Bringing new levels of efficiency and comfort to the long-range market, the A350 family is particularly well suited to the needs of Asia-Pacific airlines. To date, A350 family firm orders from carriers in the region represent over a third of total sales for the type. The A350 XWB is an all-new family of mid-size widebody long-haul airliners shaping the future of air travel, featuring the latest aerodynamic design, carbon fibre fuselage and wings, plus new fuel-efficient Rolls-Royce Trent XWB engines. Together, these latest technologies translate into unrivalled levels of operational efficiency, with a 25 per cent reduction in fuel burn and emissions, and significantly lower maintenance costs.